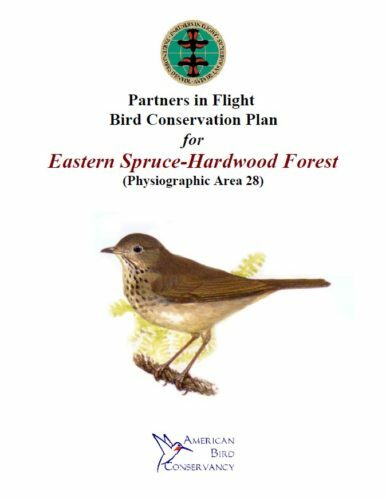 The Eastern Spruce-Hardwood Forest is the largest physiographic area in the Northeast region. Landforms within the unit range from low coastal plains (including offshore islands) in Maine and the Maritime provinces to high Appalachian peaks (4,000-6,000 ft.) in the White Mountains and Green Mountains. Virtually the entire planning unit is dominated by either sugar maple-beech-birch forest, red spruce-balsam fir forest, or a combination of the two in various proportions. Other important vegetation types include alpine stunted spruce-fir communities, coastal saltmarsh and estuaries, and numerous peatlands, bogs, and other wetlands. Human populations are relatively sparse throughout the physiographic area and are largely confined to coastal regions, and major river valleys. A few areas, such as Prince Edward Island, the Connecticut and St. John River valleys, and extreme northeastern Maine remain as pockets of active agricultural production. The most pervasive human influence on the natural landscape has been through commercial timber harvest and production. The cumulative effects of timber harvesting in the region has been a change in the age structure of the forest and a gradual shift towards greater dominance by northern hardwoods. A large proportion of this commercial forestry in the U.S. takes place on private lands; for example, nearly half of the forested land in Maine is owned by the forest industry. In Canada, private companies hold long-term leases, but lands remain in public (crown) ownership. In general, over a century of timber harvesting in this region has not resulted in the significant loss of species or populations of forest birds. Avifaunal changes have mostly been in the form of changes in local composition and relative abundances, as the mix of successional stages and conifer vs. hardwood forests shifted across the landscape.